Since the beginning of bicycle time, the measure of any racing bike’s legitimacy has been gauged by its profile and victories in competition. The ‘if the pro’s ride it, it MUST be good’ mentality is so critical that more times than not the quality of any given bicycle is secondary to who rode it and which races were won when they did. It would be fair to say that Arnold Grandjean was well aware of this marketing phenomenon and from the 1930’s on you would be hard pressed not to find a bright red Allegro in the Swiss peloton. The significance of this dressing wasn’t accidental: not only did they reflect the country’s national colors but passing before the crowds they stuck out like, well, bright red bikes. By the end of the 1950’s Grandjean’s Allegro team had seen its share of success. They had taken two of the last three Swiss Championships and the Tour of Berne. Rene Strehler, the winner of two of those contests was regarded as a national hero and Grandjean went so far as to put his picture on the seat tubes of Allegro bikes. By the mid-sixties as Strehler’s career wound down, the Allegro racing torch was passed to a somewhat unlikely source – the high-profile Cynar team of Italy. Already a mainstay in Europe which tauted Giro de Italia winners Adorni and Balmamion and sponsored by the distillers of a popular Italian artichoke apéritif, the union was a profitable one for both parties and in 1965 Cynar’s team bikes switched from Frejus to Allegro and with that a new legacy began. Even after Adorni’s and Balmamion’s departure to the Salvarani team, half of Cynar’s 16 riders would go on to enjoy cycling immortality to the extent you can get information on them on the web still today. Try this trick with the some other well-known teams and you’ll get an indication of the depth of this one squad. Cynar’s Francis Blanc was the 1962 Swiss road champion and placed 3rd in the Tour of Zurich in 1968. Edy Shutz won the Tour of Luxenberg in 1966, ‘68 and ‘70 and was ranked 37th in the world in 1966. There is a race named after him which still runs in Luxenberg to this day. Bernard Vifian was the 1969 Swiss road champion and placed 3rd in the Tour of Switzerland the same year. Rolf Maurerwas second in the TDS in 1963 and ‘67 and won the TDS in 1964, the Champioship of Zurich in ‘61 and 1961 Tour of Romandy. Louis Pfenninger Won the Tour of Switzerland in 1968 and ‘72, second in ‘71 and 3rd in 1974 and ‘75 and is ranked 478 all time, behind Oscar Camazind, winner of the 1998 world road championship. After winning the Belgian Aalst race in 1962, Cynar’s Robert Lelangue went on to become Eddy Merckx’s Director Sportif of the Molteni squad in 1972. Cynar’s Attilio Moresi won the Tour of Switzerland in 1961 and was 3rd in 1957 and ‘63 and Rudolf Hauser won the Tour of Berne in 1963. The company itself, benefitting from the exposure gained from their racing prominence saw an unprecedented turn of fortune during this period. Approaching thier 50th Anniversary, Allegro found itself the largest producer of bicycles in Swtzerland and had launched a successful sales campaign outside of the country as well. Jack Kemp was well known in the Western United states bike raing scene. Along with being instrumental in the construction and management of the Encino Velodrome (home of the 1968 Olympic trials) and founder of the famed North Hollywood Wheelman racing club, Kemp was also the owner of Village Cycles – a Schwinn dealership who had had success with importing bicycle products from Europe with Detto Pietro, Clement and Sergal which in his day was a lot harder than it seemed due to the large body of water that lie between the two known as the Atlantic. Kemp’s first introduction to Allegro was from a Swiss gentleman by the name of Hans Kuhn in the summer of 1953. 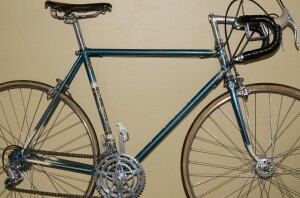 After negotiation, a deal was struck and in 1954 Jack Kemp became the exclusive importer of Allegro bicycles to America. Jack, along with his son Bobby soon began selling Allegro’s from both their retail store in Los Angeles and to dealerships across the Western US. To improve delivery, in time they would become one of the first importers to begin shipments via Swiss Air, something which was unheard of in that day in the bicycle industry. What was a 60 day, three tier shipping process (via steamer, rail and truck) was cut to only six days at a total cost of only $1.50 per bike. By 1959, Kemp was importing over 600 Allegros a year to the US – a huge quantity by 1950’s standards. Feeling the full impact of Kemp’s success,, Schwinn, in an attempt to reclaim the sales of high-end bikes lost due to this and other European lines, intentionally duplicated Allegro’s geometry on their Paramounts, – down to the double tapered rear strays. At the time, the Allegro models 56 and 57 were adorned with a decal of Allegro racing team phenom Rene Strehler on the seat tubes. Because he was relatively unknown outside of Europe and as an unprecedented gesture of thanks to the Kemps, after Bobby Kemps visit in 1957 in the years 1959 through to 1961, Strehler’s image was replaced by that of Bob Kemp on the Allegro’s shipped to the United States. A bike racer of merit himself in the US national amateur circuit, Kemp’s image was now permanently cast into the breast of Swiss excellence – quite a tribute indeed. In the late 1950’s, Arnold was in the process of retirement and the company’s helm was being handed to Ulysses Grandjean’s son Francis who, along with Arnold’s son-in-law Willy Pluss, continued the legacy which now spanned across two continents. Keeping up with the increased popularity of the Allegro line presented many challenges to the two new helmsmen, – including Francis himself making regular trips to the Campagnolo factory in Italy in a car packed with boxes of Swiss chocolates to assure prompt component delivery. Francis would stay for days in Vincenza, waiting for his orders to be filled before returning home, his car now full of Italian bicycle components. Under Francis’ tutelage, the Allegro business thrived. They had stuck a deal with Eddy Merckx to become one of only three manufacturers licenced to produce bikes with the Merckx name and graphics, prior to Eddy’s racing retirement and the contsruction of his own frameshop. Quick to capitalize on the relationship with the greatest cyclist of all time, it was in fact Eddy’s image that took the cover of the 1974 Allegro catalog and if you were to order a 1970’s vintage model 26 or 76, it would indeed by painted orange with the familiar Merckx logo and frame dressings. For Grandjean, it was becoming increasingly difficult for Grandjean to keep up with orders. They had outgrown their original four story brick factory and in 1957 began planning for the construction of a new facility near Marin which would take nearly three years to complete.